The Anime Archivist: Video Backlog: "Keroro Gunso (Sgt. 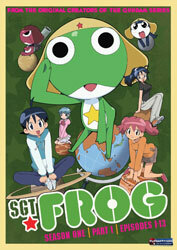 Frog)"
Format: Region 1, 2 and 4 DVD, NTSC, Japanese Dialogue with optional English dub and English Subtitles. Yes, I’m essentially at least five years behind the majority of fandom in regards to watching anime. I think this mostly because I only watch commercial stuff rather than fansubs (and I rarely watch simulcast streaming stuff), and my backlog stretches back to stuff I bought over two years ago. I’m cutting back and at least the pile of unwatched discs is getting noticeably smaller. Maybe that has to do with the smaller size of multi disc packs rather than having less actual anime left to watch. Anyway, I’ve been looking forward to watching this show for a while. I had previously seen the first three movies which are available with English subtitles on IVL’s DVDs which are only available in Hong Kong (there’s a quite a lot of unusual anime titles available in the Hong Kong market legitimately, I’ll probably do a post about it one day). But anyway, let’s talk about the actual show. The plot follows a planned invasion by the planet Keron of Earth (which the invaders call Pekopon). The inhabitants of Keron are humanoid frogs no taller than 60 or 70 centimetres. The invasion has sent forth a small five Keronian platoon as an advance force. However they are abandoned by the main fleet. The platoon’s commander, Sergeant Keroro, ends up hiding in the Hinata household, but is discovered by 15 year old Fuyuki, naturally a UFO and general supernatural/conspiracy freak. Unable to make contact with the four remaining members of his platoon, Keroro ends up being the family’s domestic slave essentially. This is mostly due to Fuyuki’s 16 year old sister, Natsumi, taking a dislike to Keroro, though Fuyuki and the kid’s mother, Aki, are pretty much delighted to have an alien in the house. Over the course of time, Keroro’s platoon members show up and take up residency in the Hinata’s house. Rich girl Momoka Nishizawa, who has a psychotic and obsessive crush on Fuyuki, has been looking after Private Second Class Tamama, a young Keronian who seems rather cute and lovable, but can go into uncontrollable rages especially if anyone gets too close to Keroro, whom he worships. Corporal Giroro shows up next. He’s a military Keronian through and through, and is upset that Keroro doesn’t take his responsibilities seriously at all. Sergeant Major Kululu, the snickering prankster of the group, has been under the care of Mutsumi Houjou, a mysterious student whom Natsumi has a crush on. Though Natsumi only knows him as Saburo and he moonlights as a popular radio host, whom Natsumi religiously listens to (though nobody seems to make the connection that the two are the same person). Finally Lance Corporal Dororo arrives. He was rescued by a female ninja called Koyuki Azumaya (who seems to have a strange crush on Natsumi). Dororo has learnt the ways of the ninja and no longer wants to take over the Earth. Unfortunately he was pretty much forgotten by the other members of the platoon. Joining them is as Angol Mois, an alien who looks like a normal human teenage girl. She has actually come to bring Armageddon to Earth in 1999, but overslept five years. She is a long-time friend of Keroro and disguises herself as a clueless teenage school girl, though she is a bit clueless anyway. Because of Mois’ closeness with Keroro, Tamama is insanely jealous of her. The platoon and hangers-on end up living in a disused basement under the house where naturally a female ghost lives. Kululu manages to create a base underneath the house, where the platoon and in particular Kululu creates his schemes and inventions. Once the main cast and some secondary players appear on the scene (such the metal hero parody, Space Deputy Kogoro, and his apologetic sister Lavie), it’s settles nicely. Usually there will be some sort of bizarre set up, usually involving Keroro creating a massive disaster, followed by a ton of jokes on that set up. Naturally the writers use the large cast as key players and the focus of many episodes. It’s not always about Keroro. For the first 60 or so episodes, each episode is split into two story halves. In fact the whole set up reminds me a lot of “Urusei Yatsura”. Certainly it feels a lot like early episodes of that show, except more focused on comedic elements and practically no hints of romance. The biggest ongoing joke in the show is Keroro’s absolute reluctance to do anything about the invasion. He’s more than happy to make Gundam model kits or watch the anime “Space Captain Geroro” (a parody of “Yamato”). Occasionally when Keroro becomes fully hydrated (Earth’s atmosphere is a bit too dry for Keronians), it will attempt to enslave the planet, but when he realises that there will be no more Gundam kits, he gives up. I felt that after the first season (after episode 51) the show lot it’s way for a while. The writers lazily use the characters failings as comedy fodder, but it does become quite predictable after a while. For example you know Tamama is going to get insanely jealous, that Mois will attempt to destroy Earth etc. However after a few episodes, the writing improves quite a bit and it mostly falls out of this mode. Apart from the humour centred on the personalities of the cast, pop culture parody, in particular anime, forms a large part of the source of comedy. Being that this show is produced by Sunrise, Gundam is a key target for parody, with “Yamato” trailing in second. “Evangelion” follows behind. But there’s also some very strange parodies of “Galaxy Express 999”, a very literal parody of “Space Adventure Cobra” and very subtle “Patlabor 2 the movie” reference. I also noticed parodies of “Samurai Troopers”, “Aim for the Ace!”, “Votoms” and even “Babel II” amongst others. Overseeing this show is Junichi Sato of “Ojamajo Doremi”, “Mahou Tsukai Tai!”, “Princess Tutu”, “Kaleido Star” and “Aria” fame. I don’t think this show is like anything else he’s done. The creator of the manga is Mine Yoshizaki. This is probably the only work of his which I have liked. Both “Arcade Gamer Fubuki” and “NaNa 7 of 7” left me cold. Funimation’s adaptation is quite good. The only real problem was the “Americanisation” of episode title cards with really bad puns, which most of the bore no resemblance to the translated Japanese episode titles as seen in the disc’s subtitles. I think there was absolutely no reason to do this at all. The Japanese titles made perfect sense once translated. The series is very much steeped in Japanese culture (not just pop culture) and probably needs some liner notes for some references, some of which I’m sure a lot of seasoned anime fans would be a little unfamiliar with. Of course none of the sets contain these. So far Funimation has only released 78 episodes of this 358 episode series. I highly doubt we’ll see all of those, but hopefully we’ll get another 26 or so episodes. Maybe. Overall, these set of episodes were pretty fun. A lot of the time I found myself laughing out loud at least once every episode or so. The writing does focus on the various characters’ traits and they do become clichés of themselves at times. However clever writing and a seemingly inexhaustible supply of situations seems to keep everything fresh for the most part. It’s got to be really hard to think up new scenarios every single week especially when each episode is self-contained. I’ll give this show 7 out of 10.